V&A Jewellery - Art deco pendant - inspired by a set of jewellery retailed by Janesich, Paris c.1925. During this period glossy black onyx was considered very chic. 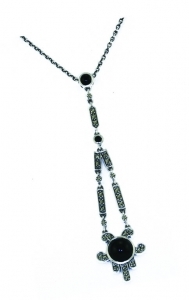 The piece consists of 3 black onyx cabochons and 31 round marcasites set in silver (5.891 gms) with a 40-45cm chain. V&A Jewellery - Art deco earrings - inspired by a set of jewellery retailed by Janesich, Paris c.
V&A Jewellery - Art deco pendant - inspired by a set of jewellery retailed by Janesich, Paris c.
V&A Jewellery - Art deco rings - inspired by a set of jewellery retailed by Janesich, Paris c.
V&A Jewellery: Art deco rings - inspired by a set of jewellery retailed by Janesich, Paris c.